Another day, another Lynnderella. 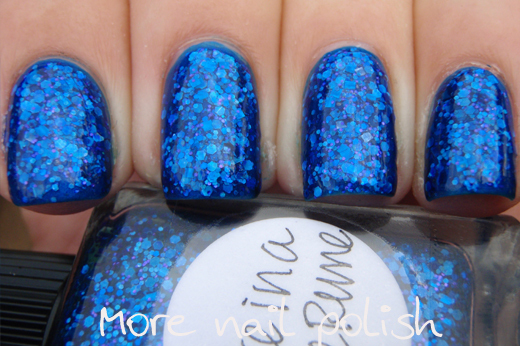 I warned you I was on a run of wearing the Lynnderella polishes I received a few weeks ago. Today's Lynnderella is Ghost of a Chance, and I can't tell you how much I love this. Actually yes I can, this is my blog, of course I can tell you how much I love this. I love it. A lot. I really, really love this A LOT! I've layered two thin coats of Ghost of Chance over white. 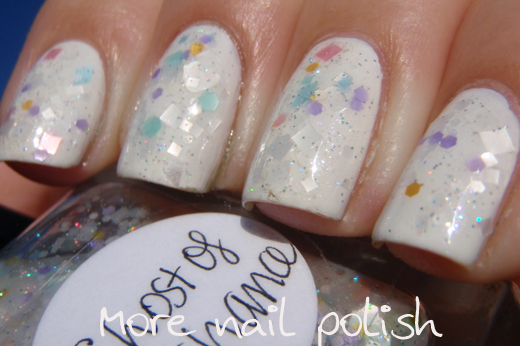 This is so perfect over white because it shows the true colours of all the beautiful translucent satin pastel glitters. There are pastel pink, blue, yellow, lavender and I'm sure there were green too, except I can't see any on these four fingers. 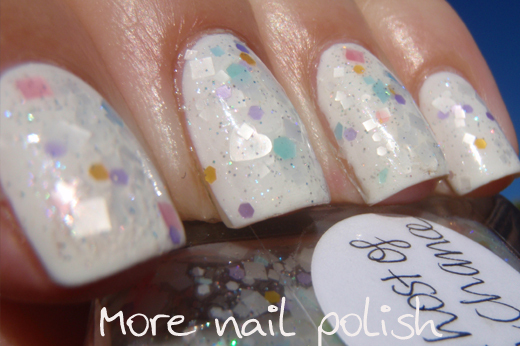 There is also lots of translucent white glitter. All the glitters are different shapes and sizes. The pink ones are large squares, the blue ones are hexes and diamonds, the lavender and yellow ones are medium sized hexes. The white ones, well the white ones are diamonds, squares, hexes and hearts. Did I mention it also has a rainbow holographic dust throughout it which provides that extra ghostly sparkle *le sigh*. Here is another blue Lynnderella. I know, I really didn't need to buy this one, especially given that it replaces Bibbitty Bobbitty Boo Blue and Mademoiselle Violette de Bleu - which therefore means it will be quite similar to both those shades. Do I really need three similar blue Lynnderella's? 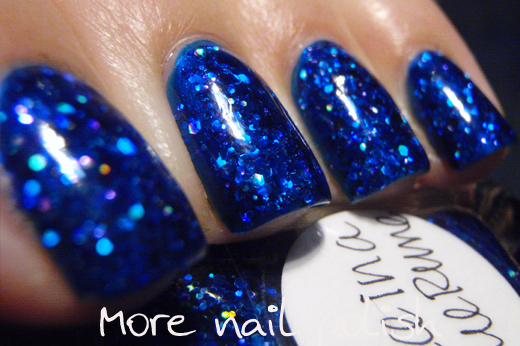 Well no, but the collector in me just needed to have this polish, because a) it has a different name, b) it' blue and c) it's pretty. I know - I'm a lost cause! 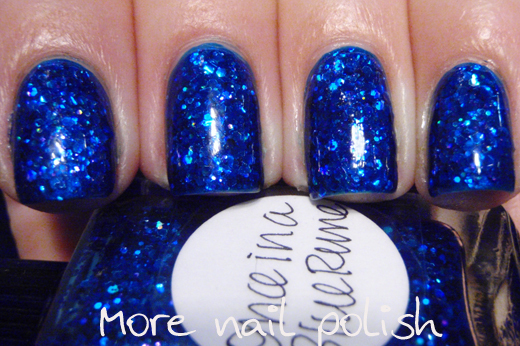 Once in a Blue Rune is a violet-leaning blue with cobalt holographic glitters and a few sparkles of purple. The photos at the bottom are taken with artificial light, where I have attempted to capture some of the cobalt blue holographic sparkles. This is one dabbled and one wiped coat of Once in a Blue Rune layered over Picture Polish Bombshell. 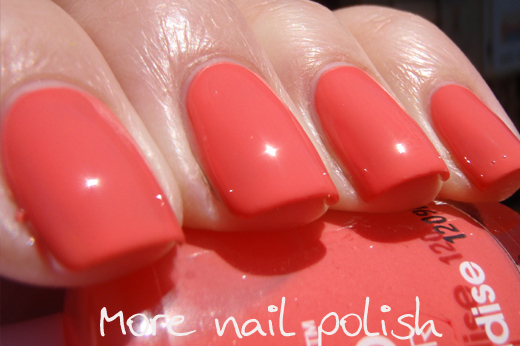 Here are four more Contrary Polish shades and they are all the most stunning shimmers. Just like the other Contrary Polishes I showed with the blue shades and the fall related colours, these four really explode in the sun. All my photos are taken in full sun because I really wanted to feature these are their most spectacular best, but even indoors these have a beautiful soft shimmer and deep rich colours. 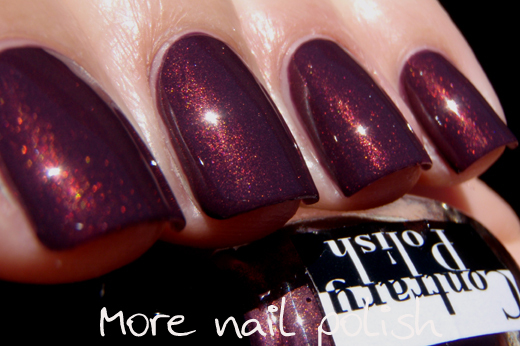 Desert Fruit - dark red-toned purple with red/bronze shimmer. 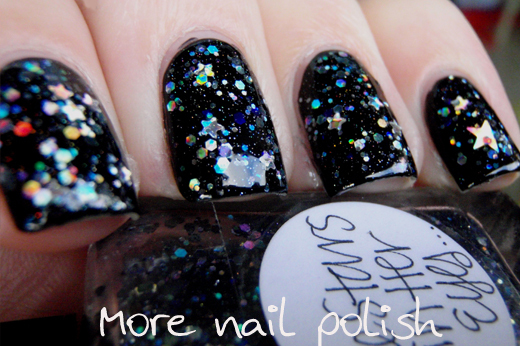 In the sun the shimmer lights up and the edges of the nail go dark and smokey. 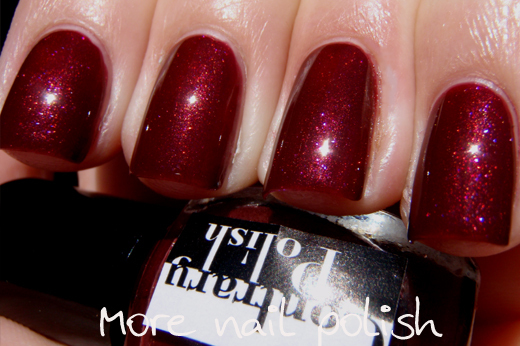 Fire brand - deep raspberry jelly with red and pink shimmer. 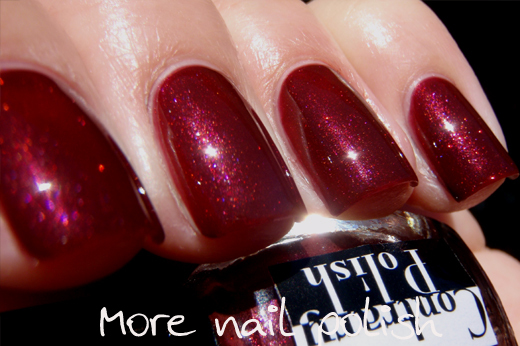 You can definitely see both the red and pink shimmer, as seen on the index finger. 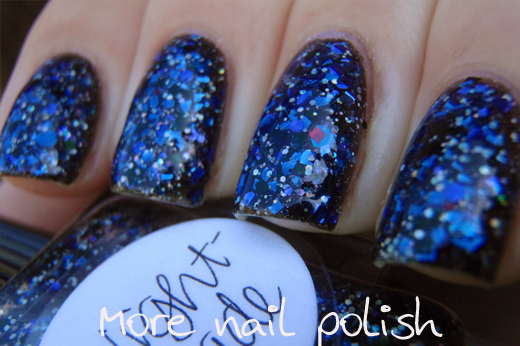 Inky Fingers - a dark smokey blue with purple and blue shimmer. Purple Smoke - light a smokey blue grey with purple and blue shimmer, again you can easily see both the purple and blue shimmer in this polish, like on the index finger. The shimmer on this really pops in the sun and I love the dusty grey look that the sides of the nails get. 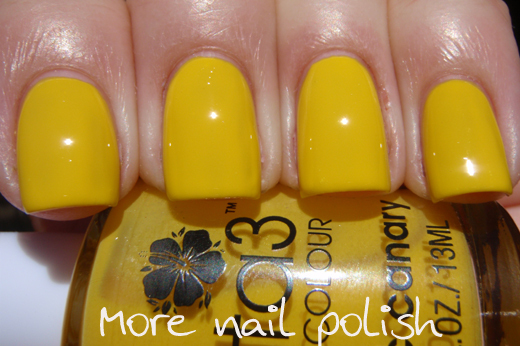 The quality of all these polishes is just fantastic and they are all easy to apply neatly. 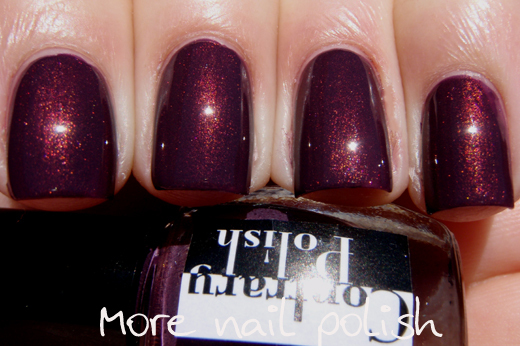 All these photos show three thin coats topped with Seche Vite top coat. I've raved about this indie brand in the past, so I wont go on about it again, except to say that these polishes are really lovely. 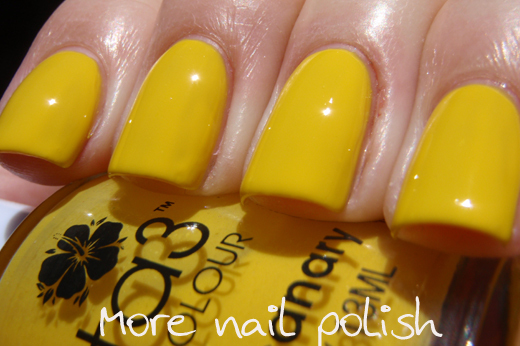 Contrary Polishes are available from Llarowe in the USA or Shoppe-Eclecticco in Singapore. 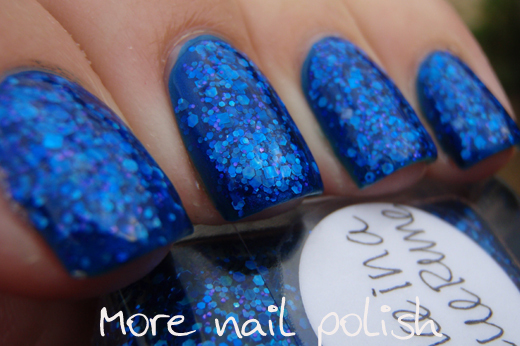 Minis are also available through the Contrary Polish blog. I really have been on a blue run of polishes lately, and I didn't even notice. 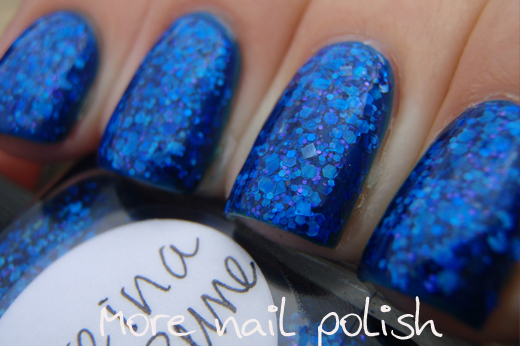 It was only when I was looking at my photos that realized that I chose to wear three blue Lynnderella polishes in a row. 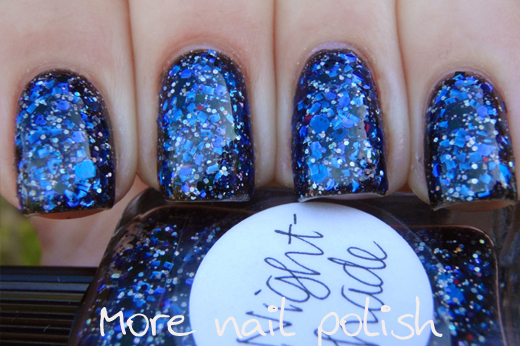 Night Shade looks predominately navy blue, but it has an assorted mix of both various shades and sizes of blue glitters as well as black glitter. What my photos don't show, is that all those small silver hexes are actually holographic. My pictures look monochromatic, whereas in real life its quite colourful and very sparkly. 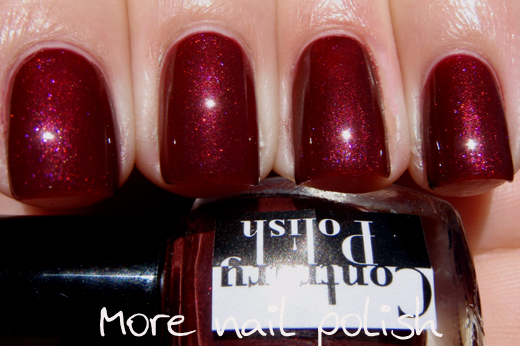 I also thought there were some stray red glitters in my polish, but when I checked on the polish description on the Lynnderella blog I noticed it mentions 'red eyes in a dark forest'. In the end I think I got one red eye on both my index and pinky, and two on my ring finger. 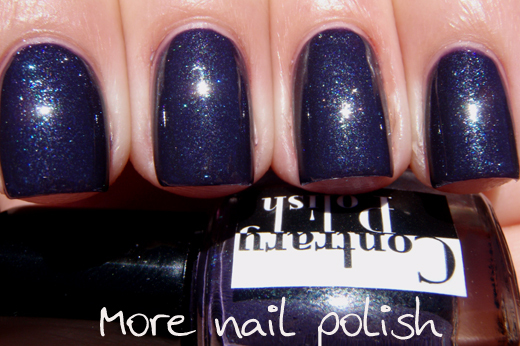 This is one dabbled coat and one thin wiped coat of Night Shade, layered over Zoya Storm. Topped with a couple of layers of top coat to make it smooth and glossy, all on a PVC glue base coat. 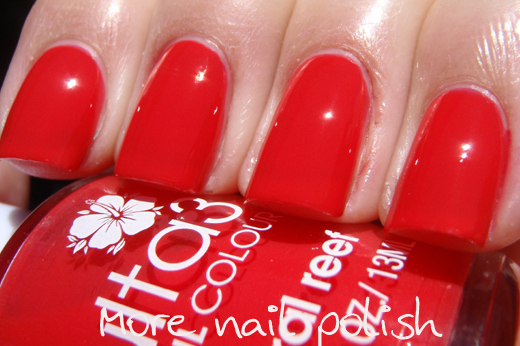 I also love the name of this polish. Night Shade. 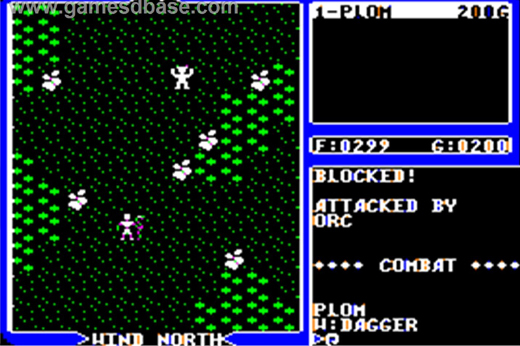 It brings back childhood memories for me from the mid 1980's, of mum and my older brothers sitting around our Commodore 128 playing Ultima IV: Quest of the Avatar. I was too little to play, but I remember it vividly. You had to find Nightshade to make spells, at least that's what I remember. Check this out, it was state of the art gaming! Lynnderella recently launched her Seasons Glitterings collection, but I've just got the Early Halloween Resurrected polishes (well some of them, not the reformulated ones of existing shades). 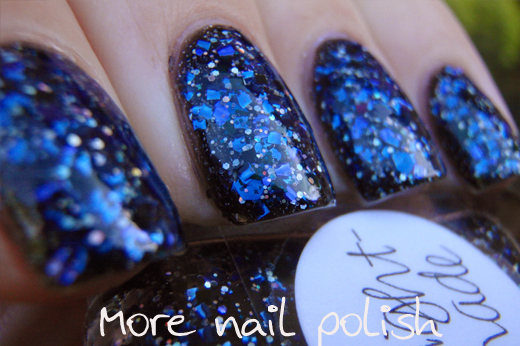 The Stars in Her Eyes was the first polish I chose to wear from the collection. 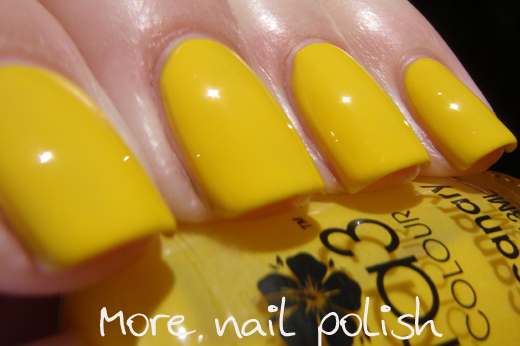 Oh I could really gush and oooooohhhhh and arrrhhhhh about this polish cause I just love the look of it so much. I have layered just one coat of The Stars in Her Eyes over regular black creme. I DIE! 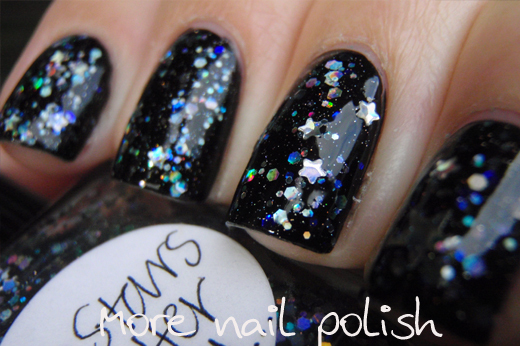 All the stars are silver holo, both the regular sized ones and the adorable itty bitty ones. 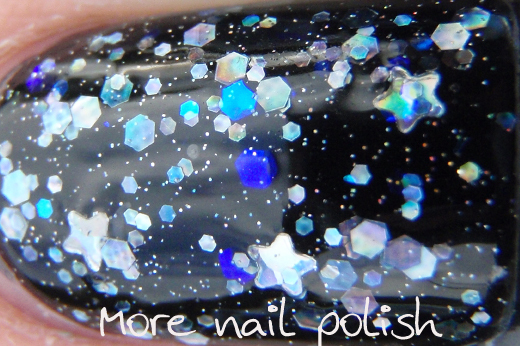 There is some holo glitter in this too, cause you can see the rainbow of colours in the bottom photos. 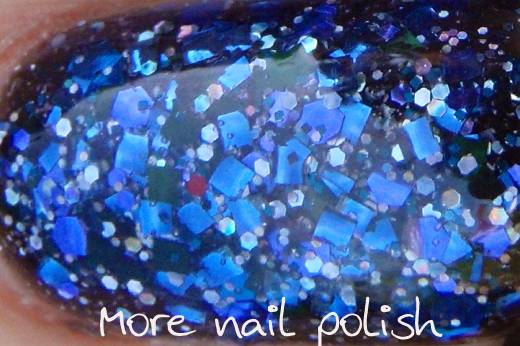 There are also those stunning rich blue irridescent glitters, which when worn over white they look yellow, but over dark colours they glow. Plus a whole bunch of other stuff that I can't pin point exactly what they are - actually I know exactly what they are, they are PRETTY!! 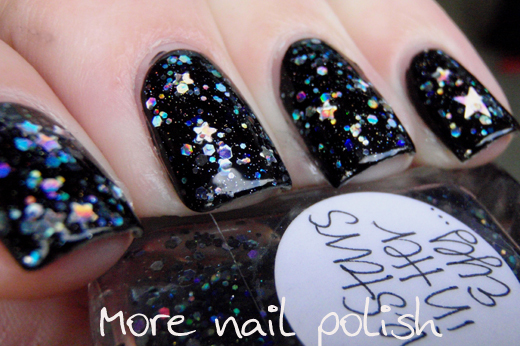 This is like galaxy nails in a bottle. Just like Katherine over at the Manicure Addict, I've been wearing a lot of Lynnderella manicures (or Lynnicures) lately. So up front apologies now to anyone that doesn't get pleasure from seeing the pretties, there will be many more Lynnderella blog posts to come. 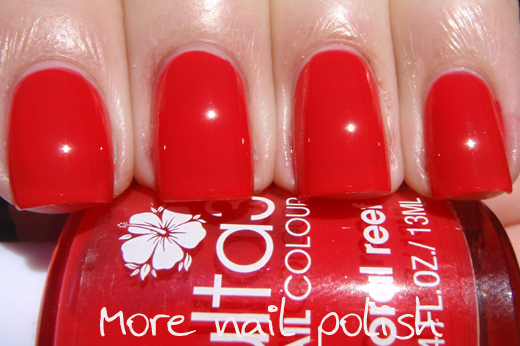 Continuing with part two of the Ulta2 candy cane polishes. 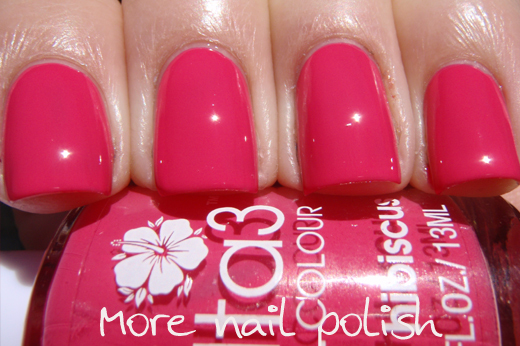 Flirty Bikini - 2 coats. 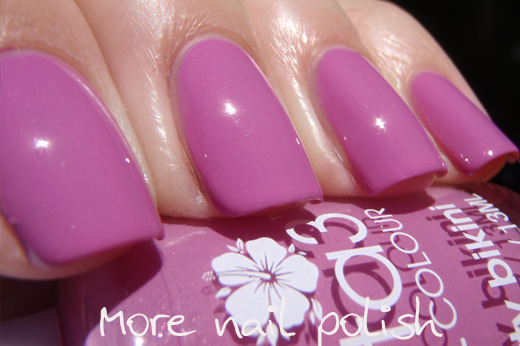 More opaque than many of the other polishes in the cane. A blue toned pink creme. Most similar to Ulta3 Plum Violet, but this is more purple. 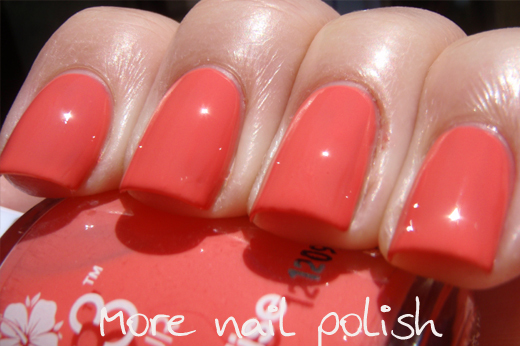 Acapulco bliss - 3 coats. 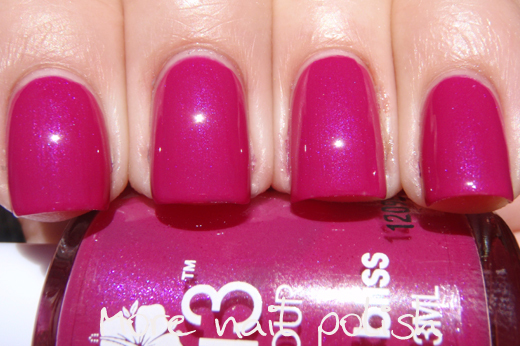 A bright pink base with a nice purple blue shimmer. Along the same lines as Ulta3 Bouquet, but the base is not as red and the shimmer is more subtle. This one is really pretty. Sea breeze swirl - 2 coats. A medium shade mint green. It's like utla3 Mojito but with extra white added. Also a pretty one. 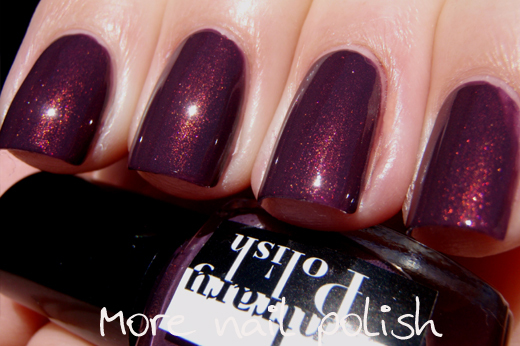 Calypso holiday - 3 coats. 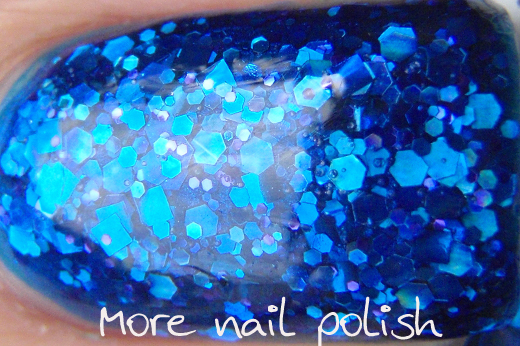 Medium bright blue with a strong shimmer, which means its a little frosty and will show brush strokes. Nice colour if you can handle the frostiness. 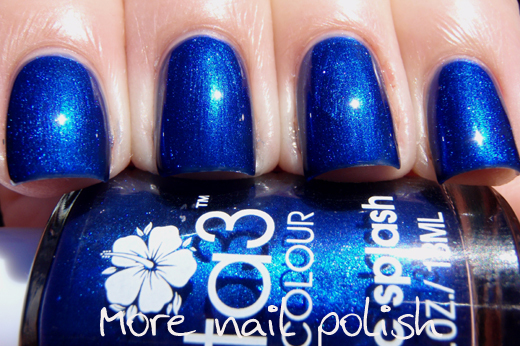 Pacific splash - 4 coats. I was so looking forward to this one, but damn, it was so watery it needed four coats to reach opacity. Strong blue shimmer which means it shows some brush marks, but not as frosty as Calypso Holiday. Beautiful, if it weren't for the 4 required coats. 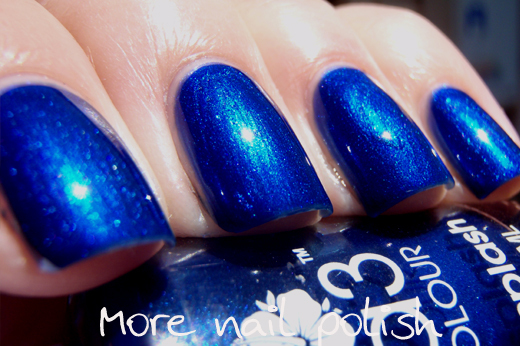 Similar to Hollywood, but this is a richer blue. So there you have them, a great variety of colours and an excellent price. 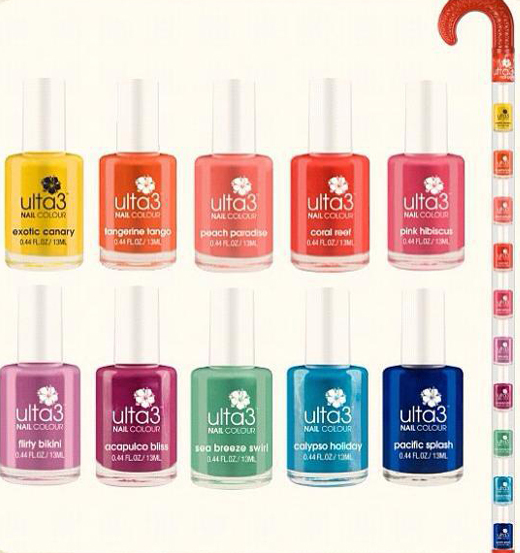 At $12.95 for all 10 polishes, this is a perfect stocking filler!